Search engine optimization has long moved away from ranking criteria like keyword density, while link spam and poor-quality content will hurt your page. SEO is evolving to focus more on things like brand name recognition and trust. This is why it’s essential for website owners to understand the importance of brand mentions as search engines are increasingly putting less stock into live links as a ranking factor. 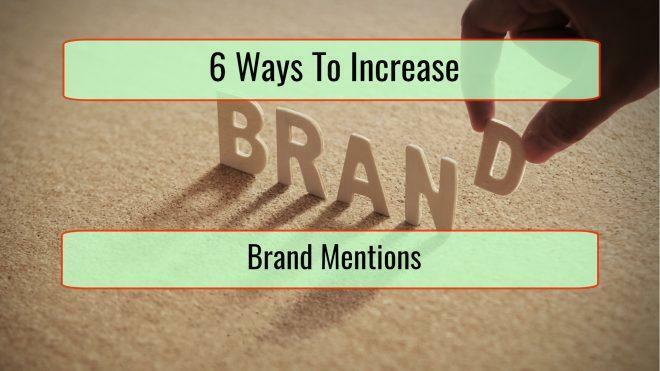 Here are six ways you can increase your brand mentions in 2019. One way to rank well is to create great content. This is content that answers user’s questions, entertains or otherwise provides real value. The best content is optimized for the questions that people are asking directly to their information appliances and indirectly when they enter search terms. It is content like this that gets promoted in search results and shared by readers with their friends on social media. You can create this type of content in a variety of ways. One is having a blog and putting out a constant series of articles of value to your customers. The key here is knowing who your target audience is and what they want to know. Answer their questions in detail, and mention your brand name along the way. Or post detailed comparisons of your product versus the competition so that people who want to decide between the two end up on your website or ecommerce product page. Influencers are incredibly valuable for a number of reasons. Because they have a smaller following, they’re seen as closer to the audience. When they recommend something, it is more likely to be seen as genuine. You can also line up with influencers whose audience fits with your target demographic. Share your products with them, and their recommendation or comparison videos will be right in front of the audience of your choosing. Influencer marketing when done right can generate leads and increases sales. Another thing that influencers have going for them is their social media prowess. You aren’t an influencer if you don’t already have that skillset. 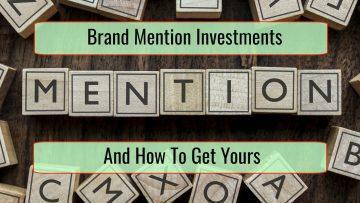 Connect with an influencer, and they’ll generate a ton of brand mentions at a minimum. They’ll be able to generate online buzz about your brand and increase brand recognition with search engines, which in return will generate organic backlinks to your website as well. Search engines give extra weight to content by journalists. A great way to get powerful brand mentions is to consult with journalists or get mentioned by them. You can do this through expert interviews by your team members. You’ll then be able to mention your brand naturally into the description. Talking to journalists about newsworthy events like charitable activities by the company, hiring fairs, building expansions and awards won by team members will all get you additional brand mentions as well. You can find reporters who want expert sources by searching for “Help a Reporter Out” calls, social media or through industry publications. All you’ll have to do is find publications related to your niche, look for their editorial calendar, create a spreadsheet with submission dates and topics and pitch away. This is an especially good way to increase the trust given to personal brands. Outside independent mentions from these publications will end up adding to the “trust” score search engines assign to your site. Guest posting is a decent way to generate brand mentions as long as you choose the right blogs for a guest post. You only want to send guest posts to brands that are a decent fit with your own or have an audience that overlaps with a target demographic you want to grow. You shouldn’t guest post on blogs that don’t have much of a following, have become inactive, or are unfocused because they accept content from virtually anyone. Conversely, you shouldn’t post on content farms or low-quality blogs. Guest posts at a minimum lead to increased brand awareness by individuals and search engines. They may drive traffic to your website. Guest posting certainly builds professional relationships, and it is one of the few options available to those building a personal brand. We’re not talking about buying stock – we’re talking about taking stock of your social media accounts. If you have a social media profile for your business, its SEO needs to include associated brand names like your business name and product names. For personal social media pages, it should include any brand name that’s associated with you such as the brand name tied to your blog or small business. While you’re investing time in revamping your social media accounts, share the content you’re creating with your brand mentions. Share every guest blog post that you create. This leads to more high-quality back links to the content, and more traffic here results in higher rankings for anything mentioning your brand or business. However, you don’t want to just associate your brand with links. Search engines are smart enough to associate mentions with a company without a link. The solution here is to share announcements about the company without a link to anything, especially if it is a post that could be shared by itself. Search engines are starting to down rank merchants that have a bad reputation due to a poor user experience. Then there’s the fact that bad reviews of your business hurt your reputation and prevent people from buying from you. One solution is improving customer service and actively seeking unhappy customers so you can resolve their problem. If you resolve the problem, they may change their review or even talk about your company in newly positive language. Another approach is sharing social media mentions of customers who praised your team members or appreciated your product. However, this may not seem authentic. After all, anyone can put fake testimonials on a website. Instead, promote your company’s appropriate channels for tech support and customer support. This is valuable information to customers, and it can prevent the angry online reviews that hurt your reputation with customers and search engines. Though search engine algorithms are abandoning ranking based merely on keyword density, brand mentions should be a major focus of your SEO strategy. 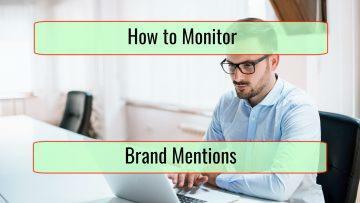 If you follow our advice and work with a qualified team, you should be able to boost your brand mentions and increase brand recognition in no time.